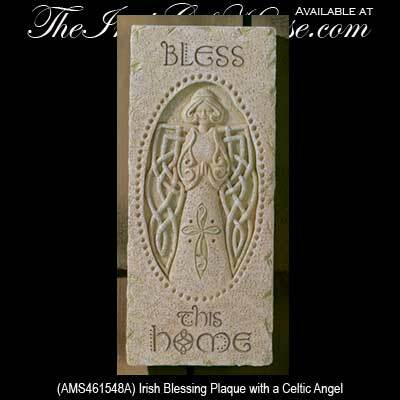 This Irish blessing plaque for your home features an embossed Celtic angel and would look great by your front door. This Irish home blessing plaque is suitable for outdoor use and is enhanced with a Celtic angel. The Irish angel on this blessing plaque is enhanced with Celtic knot-work wings and the design is made of a cement and resin combination that is fitting for garden decor; the dimensional design measures 3 1/4" wide x 7" tall. The Irish blessing plaque is ready to hang on your wall with the included cord or stand with the included metal stand; it is gift boxed with a Celtic knot history card, complements of The Irish Gift House.